At this time of year when the Arctic environment becomes warmer and the days longer, musk oxen will begin their physiological metamorphosis: females giving birth to calves, both sexes bulking up on moist grasses and moss and, most significantly, moulting their prized inner coat of qiviut fibre. 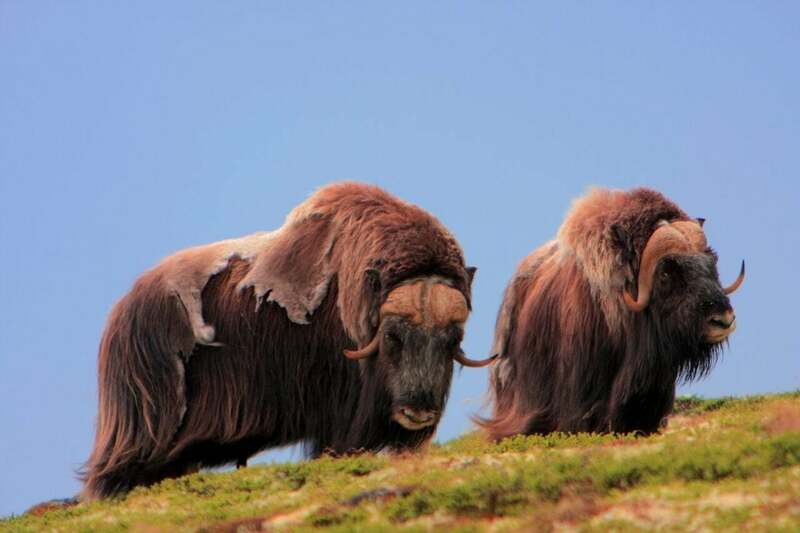 As previous blog posts have established, the musk ox has two layers to its coat: its coarse outer guard hair, which does not moult, protecting the fine qiviut underneath which is renewed every Spring. Depending upon the size of the animal, the harshness of the prior winter and the quantity and quality of its vegetation food source, each musk ox only moults between 2 to 4 kilogrammes of qiviut per year – one of the many reasons why it is so scarce and sought after. Like any natural fibre, the raw material straight from the source animal is fairly useless without further processing to make it into a yarn that can be woven or knitted. In this regard, qiviut is not so different from vicuña, alpaca, cashmere or very fine Merino wool – except that the mechanisation of processing qiviut fibre has never been done before on a commercial basis. In the initial phase, the fibre is scoured (washed) to remove natural and acquired impurities (body oil, dirt, etc.). In this phase, some of the more brittle guard and intermediate hair is also removed. However, further unwanted hair removal occurs in the de-hairing phase designed to ensure maximum quality for qiviut’s natural super-soft hand feel. The guard and intermediate hair collected in these phases is not wasted. 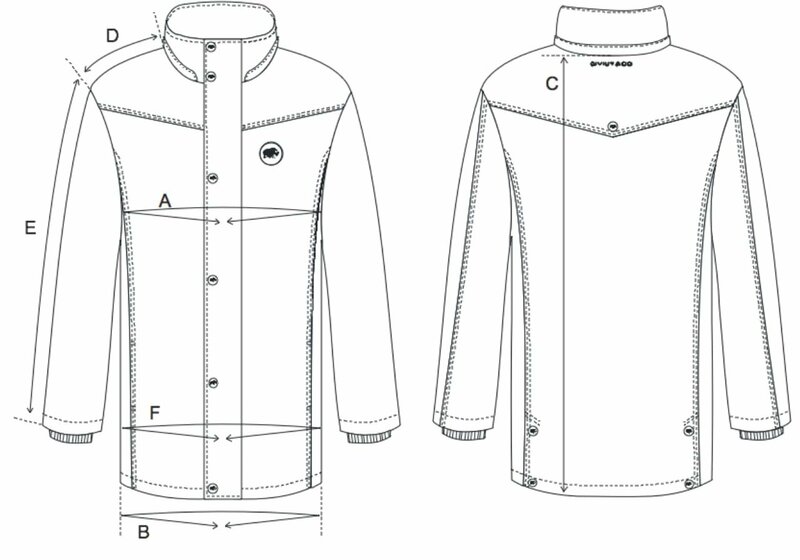 Instead, it is used to provide insulation as was done in our flagship garment, The Qiviut Jacket, and as will be the case with all of our future outerwear. It is in the next phases where things get a bit tricky when dealing with the incredibly thin individual strands of qiviut when placed on carding, blending and spinning machines. Even on machines used to handling the finest vicuña and cashmere, some recalibration is needed to allow qiviut to be processed mechanically. In some cases, this involves adjusting tension, in others reducing machine speed or, in certain instances, both. Because it has never been done before, these sensitive adjustments have only been arrived at through trial and error by QIVIUT & CO’s specialist UK vendors performing each of these processes. Carding is that phase of processing that takes the jumble of individual qiviut fibres after scouring and de-hairing and aligns them in parallel so they are ready for spinning. Blending, as the name implies, is combining pure qiviut with other luxury fibres prior to spinning and according to the design and purpose of the ultimate finished garment. 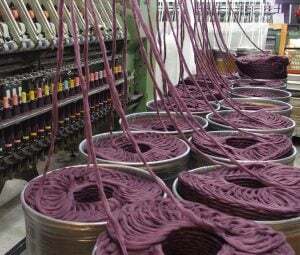 When spinning finally occurs, it is done with variables of twist, the amount of turn given to an individual strand, and ply, the amount of individual strands intertwined around each other, again depending upon the design and purpose of the finished garment. There is a lot of science that goes into setting up machines to perform all of these variables in just the right way but, at the same time, it is also something of an art. In QIVIUT & CO’s case, the yarn we are using at present for the new knitted items we will be introducing this summer are of two kinds: an 80% qiviut / 20% Merino wool blend and a 45% qiviut / 45% Merino wool / 10% silk blend, both in 2-ply worsted spun. We have left these in the natural qiviut colour choosing to blend them with some different yarns in different colours at the knitting stage. On the other hand, it is common to dye yarn after spinning, as we did for the eggplant trim on The Qiviut Jacket, and qiviut takes dye quite well so this is an option in the future. The final stage of the process for the next items we will be producing is when it all comes together on the knitting machine to become a scarf or head warmer. Again, knitting with qiviut content yarn is a good bit different from knitting other luxury fibres and it has taken quite a while to find a wonderful small family owned knitter in Italy that was up to the challenge. But we have and they were and based upon the prototype samples, we think the results will be extraordinary. In fact, this is really not the final stage of the entire process because all of the new garments have to be branded, labelled and packaged before they are ready to be sent to a customer. But describing those requirements would take a whole other blog not to mention the additional steps needed to make woven fabric into a finished garment, something we have not yet done. If you have read this far, you now know more than you probably ever wanted to know about making finished goods from raw qiviut. However, to really round out your new found knowledge you should feel the fibre for yourself and we have made it incredibly free and easy for you to do so. Just fill in the details below and, before you know it, a small sample of qiviut will be yours to experience in person. I may have missed an installment, but how do you get the hair from the animal?